Louis Jordan. Photo by Peter B. Kaars. The suite felt large, musically tracing the path from childhood to old age, and featuring a poem of Jordan’s about the adults that children become. It began with a springtime feel, content and innocent. Later motifs included a fun Mediterranean-sunset air that became the backdrop for one of India Cooke’s best violin solos. 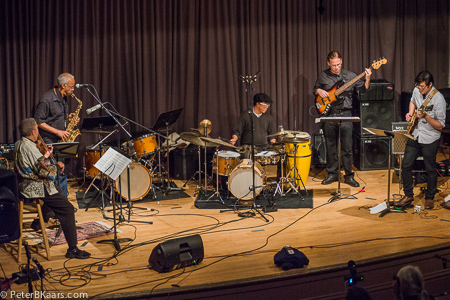 Overall, the piece carried on in rich jazz tradition, with engaging solos and, in some places, group work over forceful, swinging bass riffs. I liked the way John-Carlos Perea held the music together during those passages. Louis Jordan’s Music at Large: India Cooke, Jordan, JImmy Biala, John-Carlos Perea, Karl Evangelista. Photo by Peter B. Kaars. Toward the end, the group settled on a gentle, almost weary riff that sounded like a concluding statement. It seemed to repeat one time too many … just lingering … and then, it burst into a jaunty blues, not too fast but saucy and lively. It definitely put a smile on your face. They jammed with that for a few minutes before letting Karl Evangelista erupt into an all-out guitar freakout. I like to think this part of the suite was meant to show a bursting of happiness and activity late in one’s life, as opposed to the resignation of being used up. In that light, “Only Children” left a feeling of joy and hope in the air. Rent Romus. Photo by Peter B. Kaars. Rent Romus’ Lords of Outland played a strong set mixing free jazz with heavy, sky-high psych. It included a few new pieces from a sci-fi-influenced suite about “Dr. K.” and also at least one from the Lords’ considerable catalog. 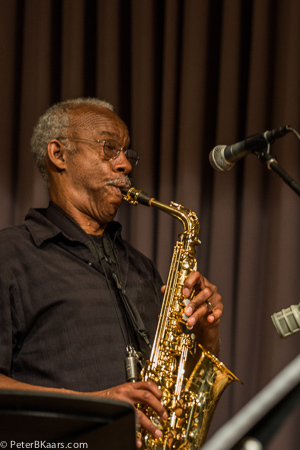 The quartet lineup was enhanced by two players from Columbus, Ohio: Hasan Abdur-Razzaq (sax) and L.A. Jenkins (guitar). 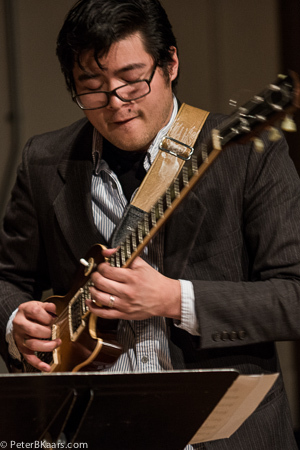 Abdur-Razzaq — part of the Rejuvenation Trio album that I reviewed a couple of years ago, added a deep sense of the jazz tradition, while Jenkins’ guitar colored the mix with psych reverb. Both were good complements to the Lords of Outland sound — Jenkins fitting the music’s dark sci-fi overtures and Abdur-Razzaq helping tether it to jazz. C.J. Borosque delivered some crisp trumpet solos, and of course, we got a few minutes of Romus playing two saxes at once. Overall, a great show. Bruckmann’s “…Awaits Silent Tristero’s Empire” has now been studio-recorded for eventual release, and one can only home Jordan’s “Only Children” can similarly live on. LA Jenkins. Photo by Peter B. Kaars. Karl Evangelista. Photo by Peter B. Kaars. 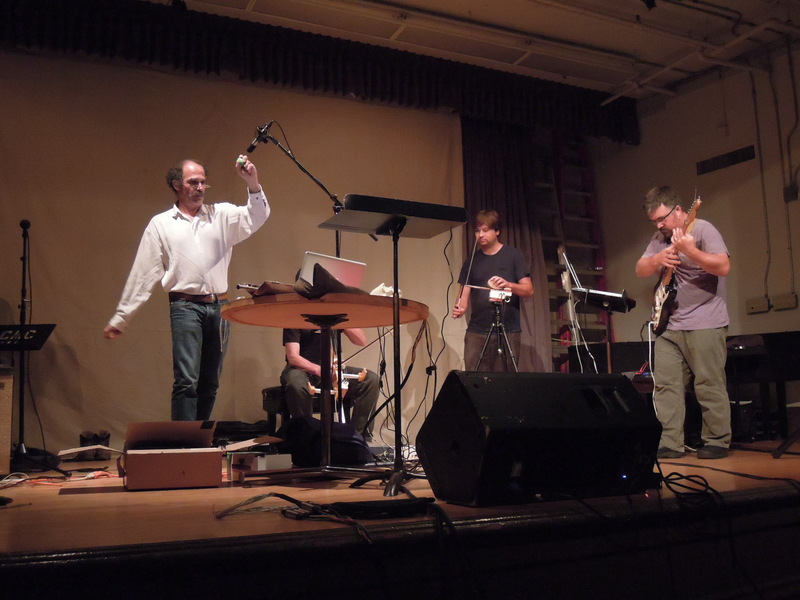 That said, I did enjoy “Vibration Hackers,” the computer-music night at last month’s Outsound New Music Summit. 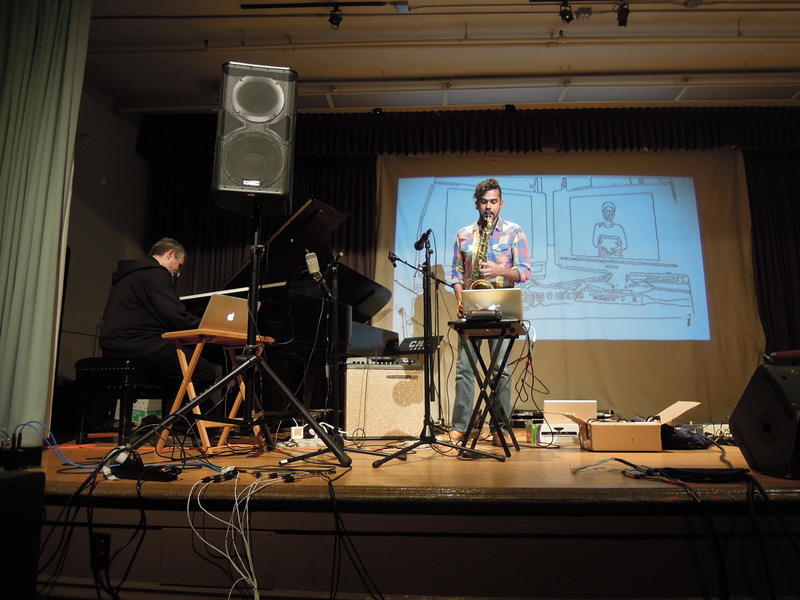 Three real-time ensemble performances were interspersed with two fixed-media performances — “tape music” pieces — all with some organic sounds mixing with the inorganic. 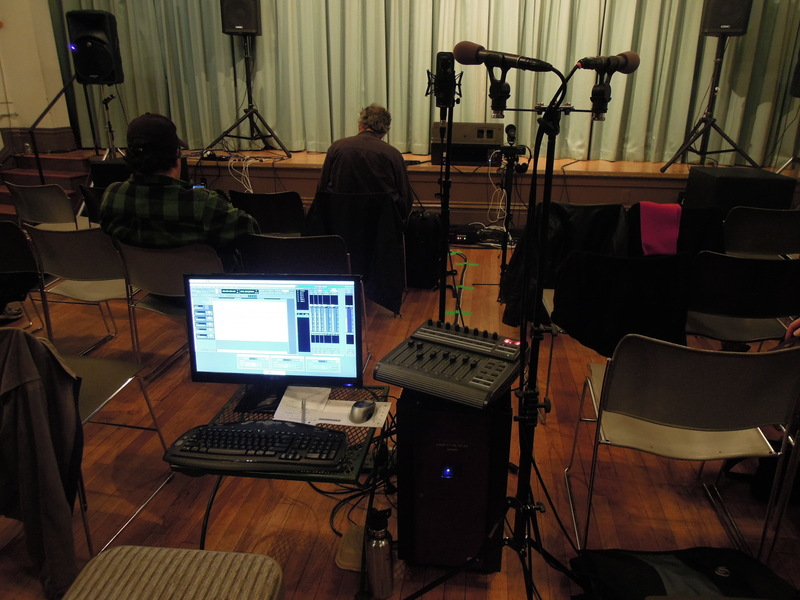 As with the SF Tape Music Festival, speakers were installed all around the Community Music Center. The Center’s cozy size made it a little difficult to get the full surroundsound effect, as the speakers closest to me dominated the sound. I could have fixed that by moving to a more central spot, but the house was pretty full, and I was content not to move. It was still a good listening experience. One advantage to this type of music is that the performers don’t need to be on stage. 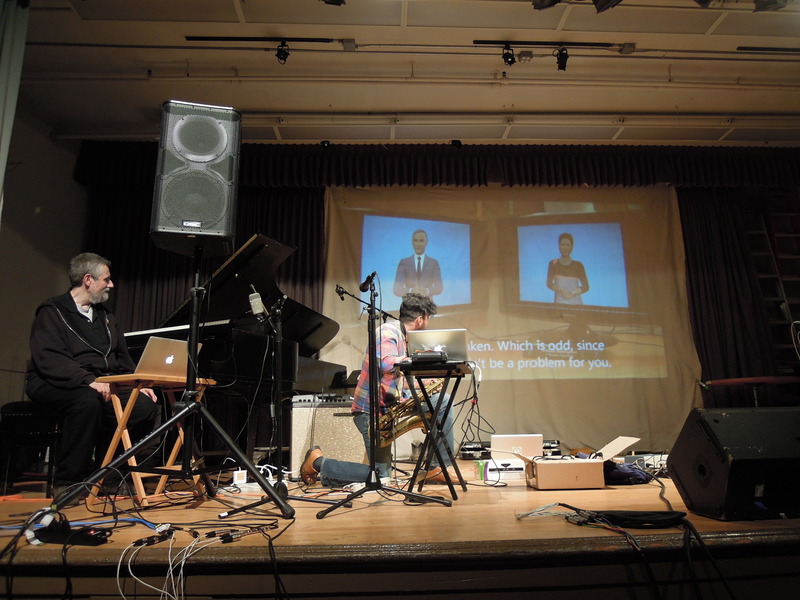 So, in a nod to the “guys checking email” aspect of laptop concerts, the fixed-media performers — Fernando Lopez-Lezcano and Ilya Rostovtsev — worked from a console in the middle of the audience. And the opening act, #MAX, played from the balcony area that’s behind the audience. 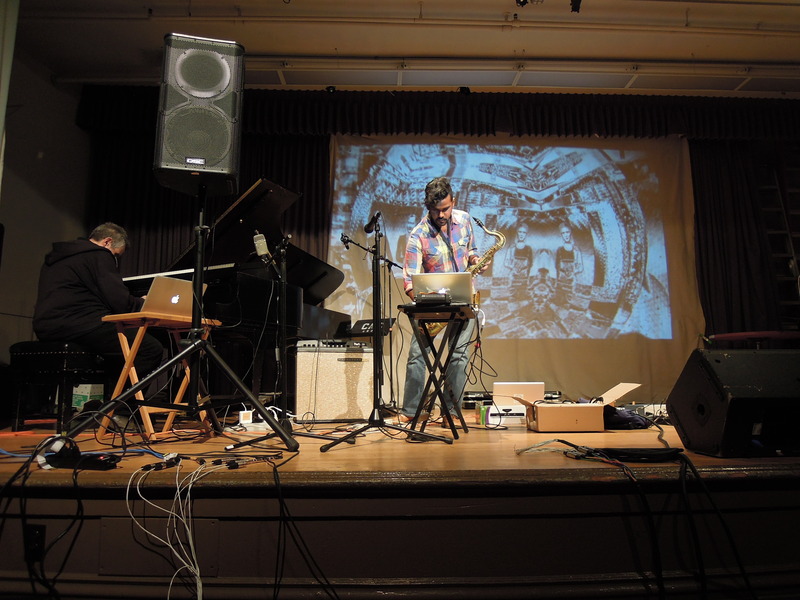 The highlight for me was the more-than-duet of Ritwik Banerjee, Joe Lasqo, and their music software agents, Maxine and Maxxareddu — all accompanied by trippy, kaleidoscope-infused visuals by Warren Stringer. They didn’t have Maxine and Maxxareddu play unaccompanied, something I was kind of hoping would happen, but that was fine — the quartets with Banerjee’s sax, Lasquo’s piano, and the two machines created a sublimely bustling collision of sounds. I’ll let the pictures tell the rest. Cables! 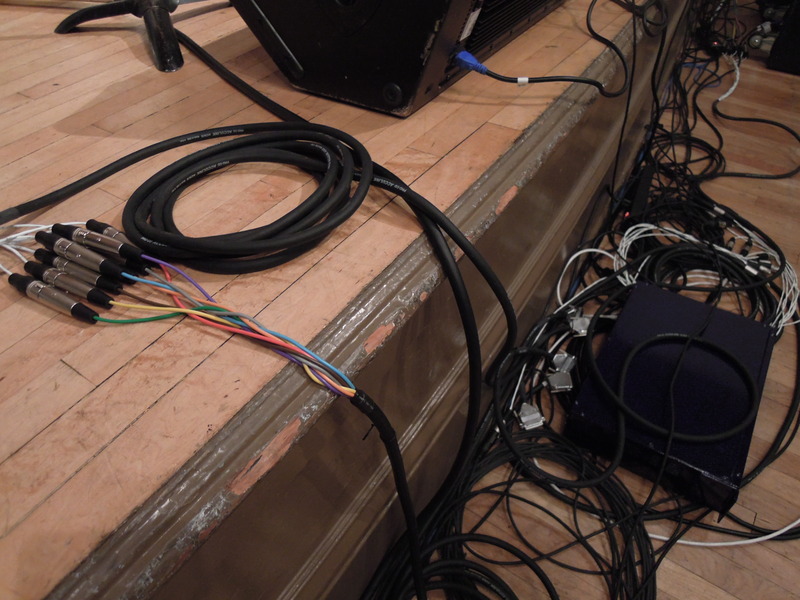 The setup for an electronic-music show is more involved than for a string quartet. #MAX prepares on the balcony at the back of the house. #MAX’s visuals included a changing screenshot of text. 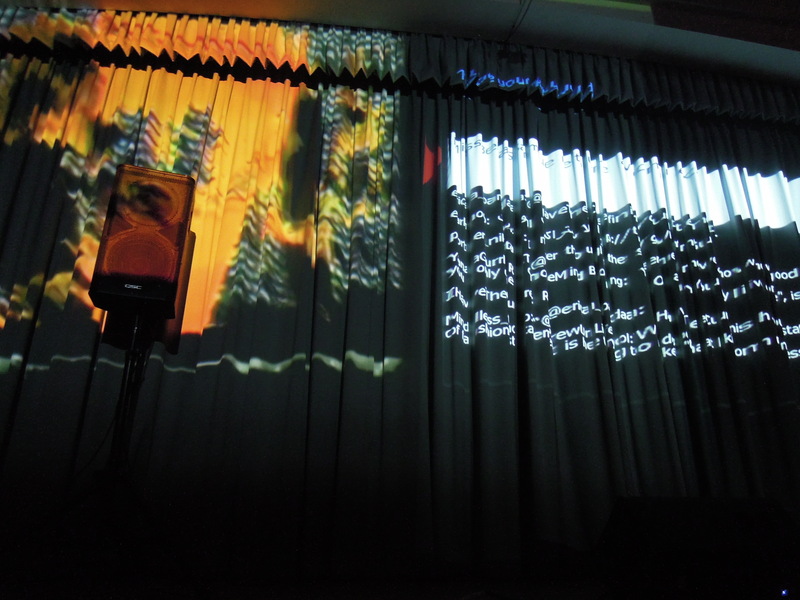 The curtain distorted it into a babble of language, matching the performance’s tangle of speech and sound. 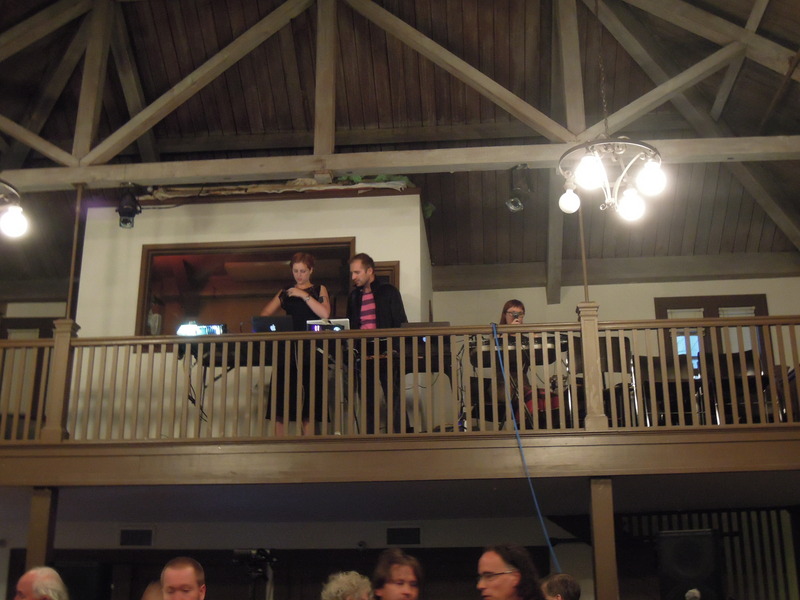 The console where the solo performers — Lopez-Lezcano and Rostovtsev — would perform. Lasqo and Banerjee opened their performance by playing the Cornell video clip that inspired them. Banerjee, with Warren Stringer’s visuals. Maxine played hornnotes of her own, creating a virtual dual-sax front. A shot that includes Banerjee actually playing the saxophone, in case you were wondering. CCRMA Ensemble, setting up. Chris Chafe on celletto. The horizontal plank is a daxophone: carved, polished wood that resonates when bowed or rubbed. More about that here. The musician is John Granzow. Photo by Peter B. Kaars. 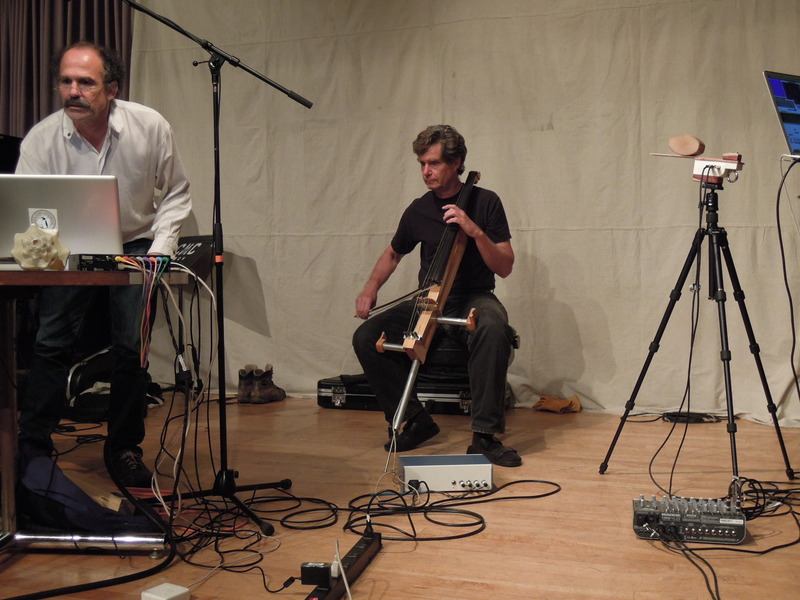 CCRMA Ensemble’s performance included a theremin-like instrument triggered by proximity. It’s on the table and being conducted by Roberto Morales-Manzanares (white shirt), who also played flute. 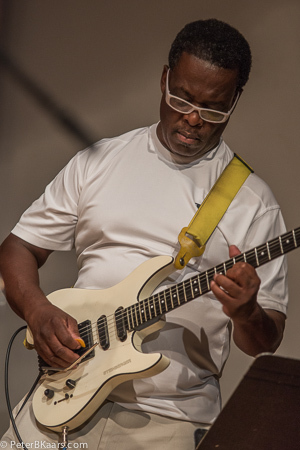 Rob Hamilton on guitar. August has been a pretty busy month. I’ve had three trips out of town since seeing the Outsound New Music Summit and the Sun Ra Arkestra. During the time away, I also saw A Midsummer Night’s Dream and a snappy, rockabilly Taming of the Shrew at the Oregon Shakespeare Festival. Inspired by Kyle Bruckmann’s Pynchon piece, I read the first few chapters of Thomas Pynchon’s V — and while I can at least understand what’s going on, the book is full of references that I’m not catching; it’s stuffed with knowledge from all directions, just as Bruckmann had said. Life should be back to normal for a few good, steady months now. I’ll be aiming to catch up on posting something about all those shows.